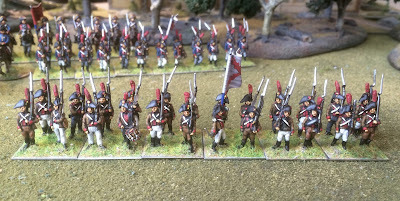 I have been interested in adding a Spanish force to my Peninsular war units for some time and the commissioning of a new 18mm army allowed me this opportunity. I really know very little about this army and I have to say researching this force was much more challenging than I had expected. I did not even know where to start, I knew I wanted a brigade sized force rather than a division. The Napoleonic variant of Chain of Command that I favour as a ruleset usually has 3-4 brigades per side, so I felt the addition of a Spanish unit would add some variability to a game. 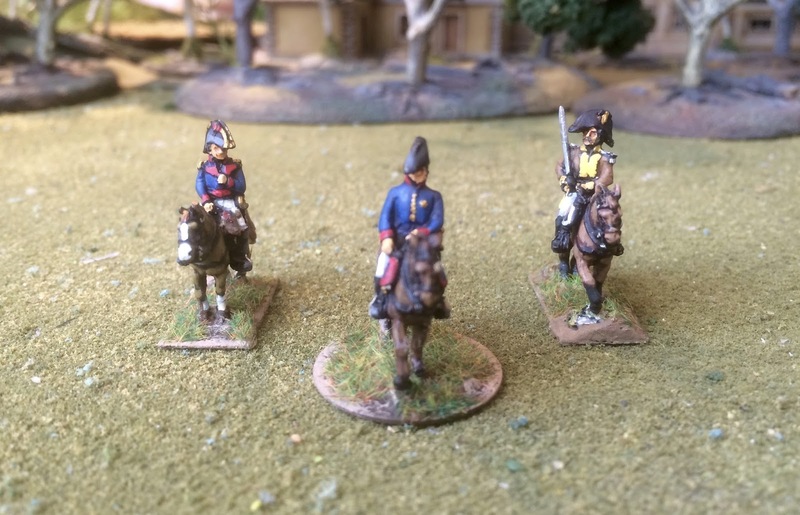 With some research I found out that Spanish Divisions in the Napoleonic era were actually brigade sized so this worked out well. I then left it to Pep, the commission painter who would be doing the force, to pick something that he was interested in painting. He decided on Portago's 3rd division at the Battle of Talavera in 1809. I asked that he add a unit of artillery and cavalry to the force and off he went. The Spanish Army underwent a massive change after the battles of 1808, where the regular army was essentially destroyed by the French. The cities and regions of Spain responded to these loses by raising many volunteer infantry units. 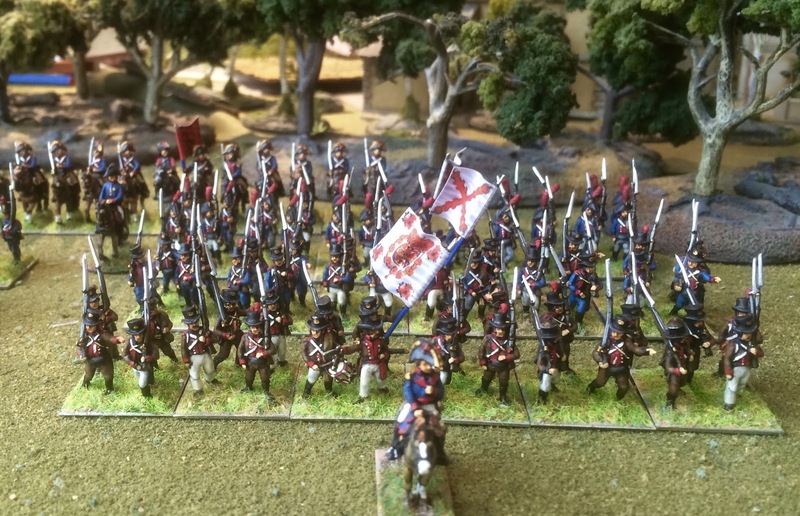 Steven's Balagan website provides a very nice overview of the Spanish Order of Battle during the Peninsular War. Here is a direct link to a painting guide on his site. Within a couple of months he had the force painted and I received that last figures about a week ago. He really did quite a nice job on them. The only Spanish Napoleonics I had previously painted were from an earlier period when they all had white uniforms, so I was happy to see the blues and browns that make up this post 1808 force. The army is made up of regular and volunteer line units, a light unit as well as a militia unit. I would love to hear from readers on how they would rate the units in this force. GB-CoC allows for elite, seasoned and untested units. 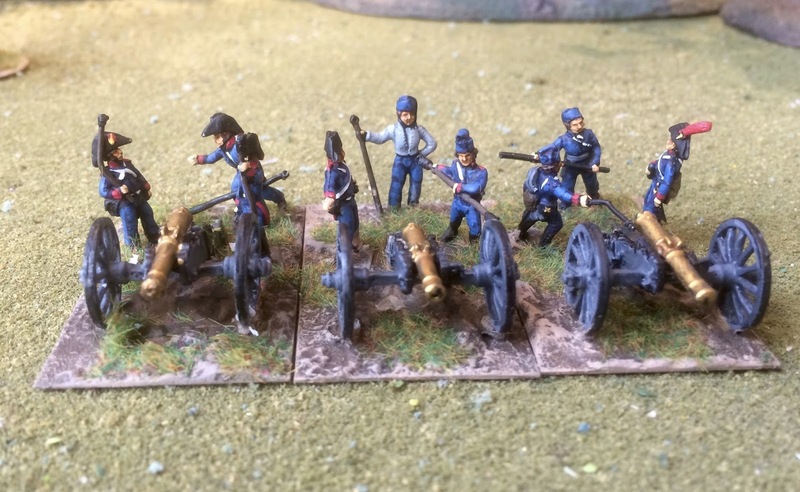 The most valuable resource I found on line was actually the blog of another wargamer, JJ's Wargames. I found this excellent painting guide on his site for those who are interested. You can also read an excellent series of posts about his Spanish army and the Battle of Talvera on his blog. Great "small" force - 6 infantry, 1 Cavalry, 1 Battery. 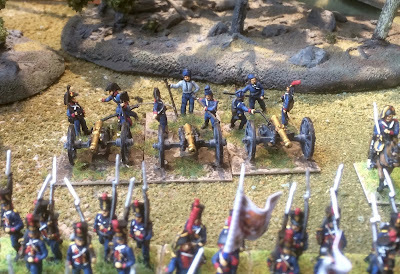 The Spanish certainly ought to be on the table for most Peninsular War games (along with Portuguese). 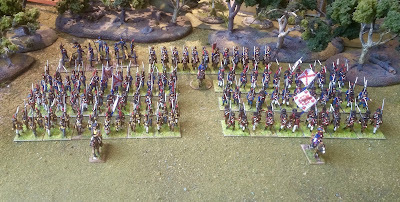 Adding a 28mm Spanish army remains in my plans, once I finish the British! Yes it is a perfect little force! 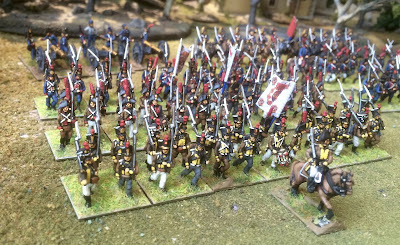 Stunning looking Army, lovely painted figures and flocking of bases - marvelous! Great looking force buyt can they fight? Really very nice looking units there John. I'm sure they will do you proud! The thing I find when playing with Spanish is that everyone expects them to do badly, so when they do win a melee let alone a battle, there's cause for celebration. This is one army were randomly determining the quality of the units just before each game makes more sense than anything else. The historic performance could be so variable on the day. I think that is a superb idea John, I will respond with a plan on the yahoo site. Very good-looking Spanish formation, John! Great looking army - I may have to copy you in 28mm once I finish my Portuguese. Thanks Miles, the Spanish are interesting for sure. Nicely done John. I hope Portago's boys give you as much pleasure as they have me. 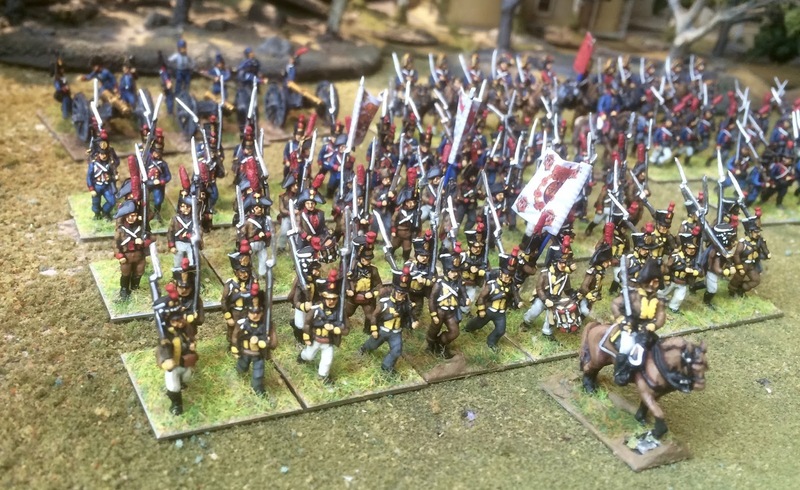 We have come to the conclusion we can never be sure which Spanish troops have turned up on the table, namely the ones that run on the first volley and the ones that fight to the last man. Well we will see today JJ. Spanish cavalry = poor. Spanish artillery = good. Spanish Infantry = depends on where experience and training of the men, just like every army. The difference about the Spanish was the experience and training varied a lot. The guys that ran the night before Talavera at the sound of cannon fire were new recruits who had only been soldiers for a few days - no wonder they ran. 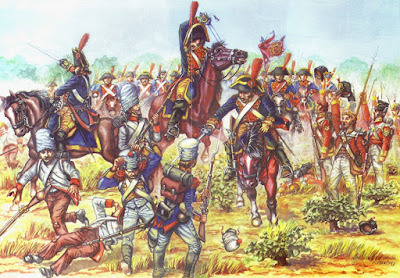 The lucky Spanish who were trained and had some experience could stand their ground just like the French or British. Trouble is precious few got that opportunity. I've studied Albuera quite a lot, and the Spanish were very good, and one of these days I'll do Talavera. I'm sure there will some staunch Spaniards present - despite British propaganda.